Ukraine Elections: Why Should the EU (and Italy) Care? – Центр "Нова Європа"
Home - Research - Ukraine Elections: Why Should the EU (and Italy) Care? Ukraine Elections: Why Should the EU (and Italy) Care? The 31 March presidential elections in Ukraine matter to Ukraine, its region and the EU. While the majority of experts deem it impossible to have a winner in the first round and, thus, expect a second one in April, the March contest will be a first important step in the crucial process of determining the direction the country will take. Thus, while we should not hold our breath on election day, we should definitely keep a close eye on the contest and its outcome. First of all, these mark the first elections in Ukraine’s history when a “pro-Russia” foreign policy card cannot be played by the political candidates. If in 2013 the Association Agreement with the European Union and the Customs Union with Russia were two rival projects for Ukrainians, in 2019 support for the EU is prevailing among the population — 50% of Ukrainians support the country’s integration into the EU, while only 9% are in favour of the Customs Union. Ukraine’s European and Euro- Atlantic course has also been recently voted in to become a part of Ukraine’s constitution. And yet Ukraine’s pro-Western integration course is far from being undisputed. First, support for the EU is very unevenly spread across the country, ranging from over 80% in the western oblasts to some 30% in the Donetsk, Luhansk and Odesa oblasts.5 Second, while none of the three candidates currently leading the polls — the incumbent president, Petro Poroshenko, the former prime minister and ex-energy tycoon Yulia Tymoshenko, and the comedian and political newcomer Volodymyr Zelensky — questions EU integration on paper, some candidates’ electoral programmes or actions look at odds with this goal. On paper, Tymoshenko supports good relations with Brussels — and, eventually, a possible EU membership — but she criticizes the reforms promoted by the EU and IMF and advocates economic isolationism. Zelensky’s fussy approach is also critical of the IMF while giving lukewarm support to EU integration. As of March 2018, it is Zelenskyi who is leading the race, with some 25% of support, while Poroshenko and Tymoshenko keep shifting in and out of second place in various polls. Importantly, some 26% – in fact, the “golden share” of these elections — of those who are going to vote, are still undecided about their choice, which may bring some surprises on the day of the poll. 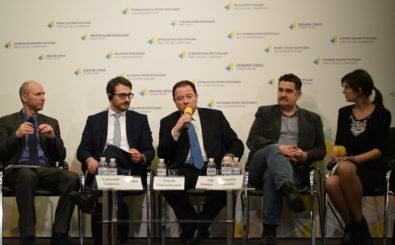 Finally, these elections will likely feature an unusually high turnout in Ukrainian terms — as of March 2019, 83% of Ukrainians declared that they are going to participate in the elections (in the 2014 presidential elections turnout reached 60%).8 This is likely a sign of increased civic mobilization and the perception of civic responsibility among Ukraine’s citizens, which grew more acute after the Euromaidan and the start of the Russia-Ukraine conflict. You can read the full version of the discussion paper in English and Italian.